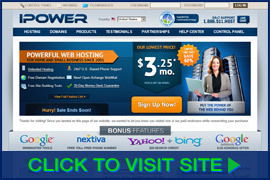 The prominent offer on the IPOWER homepage promises “powerful web hosting for home and business” for only $3.25 per month. We incorrectly assumed it to be their lowest-cost plan. It is not, renewing at $10.99 per month for a 1-year term. Instead, we purchased the cheapest plan based on renewal rates — the Starter Plan — which renews at $5.95 per month for a 1-year term. The results proved to be disappointing. 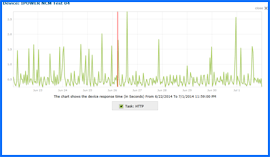 Server problems during testing caused the reliability and page-load speed ratings to plummet. While the issues were limited to a single day, the damage had been done. Unfortunately, IPOWER has earned the NCM Online designation of NOT RECOMMENDED. IPOWER offers three shared hosting plans. The Starter Plan (renews at $5.95 per month for a 1-year term) is the cheapest of the three, but is limited to a single domain, MySQL database, and e-mail account. Disk space and bandwidth are limited to 5GB and 250GB respectively. The Pro Plan (renews at $10.99 per month for a 1-year term) is offered at a deeply discounted rate for the first term and includes unlimited domains, disk space and bandwidth. It provides for up to 25 MySQL databases and 2,500 e-mail accounts. It also includes ShopSite Starter (15 products) and a free domain name. The Pro Plus Plan (renews at $12.99 per month for a 1-year term) provides all the Pro Plan features while allowing for unlimited e-mail accounts and a total of three free domain names. It also includes an upgrade to ShopSite Plus (50 products). For those interested in ecommerce functionality, SSL certificates are available for all three shared plans at an additional cost of $59.95 per year. Note that dedicated IP addresses are not available with IPOWER shared plans. Screenshot of IPOWER vDeck 4 control panel. Click to enlarge. For testing and reviewing purposes, we selected the cheapest available shared plan — the Starter Plan — and proceeded to checkout. The two-step checkout process is relatively fast and easy, but we did take issue with two aspects of the shopping cart. Further, two of the additional-cost options are pre-selected and added to the shopping cart total. You must uncheck these boxes or be billed for them. Making additional-cost options available from within the shopping cart is certainly a common and completely ethical business practice. However, pre-selecting them without our consent is not. Unfortunately, this practice is something that has become all too common in the web hosting industry. We unchecked the added-cost extras and used the PayPal payment option to checkout. The “Getting Started” e-mail arrived in our inbox within five minutes of completing our purchase. It included all of the information required to set up our test site quickly — including e-mail server settings, FTP login, control panel login, nameservers, and more (click for sample test site). We uploaded our simple NCM Online one-page test site and then proceeded to set up the Dotcom Monitor reliability and page-load speed testing. IPOWER provides the vDeck 4 control panel (see screenshot above right) with its shared hosting accounts. 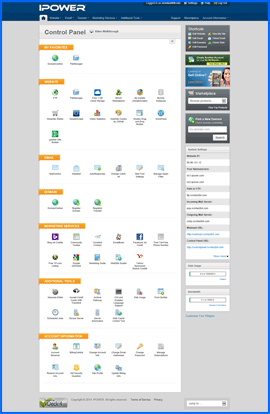 While not quite as comprehensive as the popular cPanel control panel, it is user friendly and makes for an adequate substitute. Content management systems and applications such as WordPress are installed using the MOJO Marketplace “one-click” installer. We do prefer the Softaculous apps installer as Mojo is slower and displays advertising; but it quite capable, and includes an extensive array of free scripts and applications. Ultimately, it gets the job done. IPOWER Uptime Test Results Chart. Click to enlarge. All web hosting services reviewed by NCM Online are subjected to 10-day uptime and page-load speed testing. Beginning on 6/22/14 and concluding on 7/1/14, our IPOWER-hosted website was checked for uptime and page-load speed every fifteen minutes. Approximately two thousand individual checks spread across 13 worldwide locations were performed during the 10-day test period. Of the 978 server reliability checks performed, 962 were successful, while 16 failed. The failures were all TCP 10054 errors (existing connection forcibly closed by the remote host). All 16 errors occurred during a single one-hour thirty-nine minute span on 6/26/14. Uptime testing concluded without additional server errors (see uptime test results chart above right), but the damage had been done. IPOWER’s 10-day uptime percentage proved to be a disappointing 99.565%. IPOWER Speed Test Results Chart. Click to enlarge. 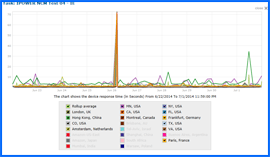 The server issues on 6/26/14 also negatively impacted IPOWER’s page-load speed test results. During the 10-day test period 966 speed checks were performed. Page-load speed averaged 2.5076 seconds at the 13 worldwide test locations, and 2.2770 seconds at the 7 United States test locations (see page-load test results chart right). These were some of the slowest times we have seen to date and account for the lowly 0.5-star speed rating. In order to get a better measure of IPOWER’s server speed during uptime, we also calculated the results from 6/27/14 thru 7/1/14. Those 471 page-load speed checks averaged 1.5678 seconds at the 13 worldwide test locations, and 1.2533 seconds at the 7 United States test locations. Those speeds were more in line with our expectations and would have earned a 4.5-star speed rating. Unfortunately, we do not make exceptions for bad server days. Server reliability and speed issues, as well as a low satisfaction rating, prevent us from endorsing IPOWER at this time. IPOWER has earned 3.5 stars and is not recommended by NCM Online. Cheap website hosting company price comparisons based on 1-year term list price before coupon/promo codes or limited time/introductory offer discounts. These are the renewal rates for the second year of hosting. To ensure that you receive the most affordable IPOWER pricing possible, please visit our Web Hosting Coupon Codes page for current discounts and special offers before making any purchases. IPOWER, which began in 2001, has grown into a leader in the website hosting business. The company offers a large variety of online services for startup and established businesses around the globe. The firm’s proprietary control panel — called vDeck — allows access to over 200 features, services and tools. It enables the company to make a wide selection of web hosting applications easily available to clients. The company’s staff is dedicated to giving customers world-class support and uptime, cutting-edge technologies, and a worry free hosting environment. Whether a client is new to the Web or is an experienced website designer, IPOWER has hosting plans, tools, and a devoted member support team tailored to fit the customer’s needs and online goals. IPOWER offers a basic hosting plan for the regular price of $8.49 per month that includes unlimited domain hosting, free domain registration, unlimited disk space and bandwidth, free site-building tools and templates, and new Open-Xchange WebMail. Customers receive 24/7 customer support, access to blogs, forums and galleries and a 30-day money-back guarantee. Customers can display a Green Certificate on their website stating that it is powered by renewable energy, because IPOWER offsets 100% of the energy it uses through the purchase of wind-generated Renewable Energy Certificates (RECs). IPOWER’s tremendous growth, which at one point led it to be included on the Inc. 500 list, has been fueled through both word of mouth and a successful affiliate program. Clients numbering more than one million and representing more than 100 nations rely on the company’s platform each day for security, speed, consistency, and global reach. IPOWER offers a redundant and dependable hosting infrastructure built on cutting-edge technologies. Rapid OC3 Internet connections with triple redundancy allow visitors to access websites quickly. Email files and websites are handled by a cluster of load-balancing Linux servers running Apache Web software. This setup ensures that sites will load swiftly and not be adversely impacted if one machine fails. The firm also uses NetApp storage clusters, like those utilized by Yahoo, Merrill Lynch and Texas Instruments, to store each file in a minimum of two places to ensure reliability. At IPOWER, clients aren’t anonymous numbers. The company listens to them; gets to know them, and undertakes changes based on their suggestions. Monthly surveys and focus groups are conducted by the “Customer Experience” team to monitor customer satisfaction and discover where improvements can be made. The firm uses real customers to perform testing on new hosting tools being developed so it can determine if the tools are user-friendly. The company’s hosting structure helps guarantee that clients’ email and websites are maintained in a secure and reliable environment. It’s easy for a successful company to become complacent, but IPOWER has chosen a different path. The company is always seeking new and better ways to use its strengths to assist its clients. One way it does this is by leveraging its position as an industry leader to form strong alliances with industry giants, including WordPress, Yahoo!/Bing, Google, Facebook and ShopSite. This video tutorial demonstrates the installation of WordPress on an IPOWER shared hosting account using the vDeck 4 control panel and the MOJO Marketplace applications installer.